Seriously. My mom went on a marketing spree in Bulungan last Sunday. One of her hauls was this big bucket worth of mussels, locally known as tahong, for 20 bucks (roughly $0.50). It must be around 3 kilos worth of mussels. She also got a bunch of shellfish innards sold for Php50 a kilo. The interesting thing with these innards is that once she looked closer, she realized that the innards contained scallops in it. And scallops for 50 bucks is definitely a bargain in my side of the country. The moment she got home, she showed me her seafood stash and I can’t think of anything else but adding it into a pasta. My aunt from Italy taught me this recipe. It might be close to a simple marinara sauce but lighter and sweeter in flavor. Whenever we have seafood, even if it’s just mussels, I always try to cook it in this way. You can’t go wrong with this recipe as long as you have fresh ingredients. You can’t get that sweet briny taste if you don’t have fresh seafood. More than that, you’ll also get a tummy ache if your seafood’s not fresh. In this recipe, I only have mussels and scallops. You can be more experimental with your ingredients by adding other shellfish like clams, halaaan, and maybe some shrimps. 1. In a boiling pot of water, cook the pasta for 11 to 12 minutes. 2. In a warm pan, pour around 2 tbsp of olive oil and then the garlic. Cook the garlic until it’s soft and then add the onions. Once the onions are translucent, add half of the tomatoes and cook the tomatoes until they’re soft. 3. Add the mussels and cover the pan so that you can steam the mussels. Once all the mussels are opened, you can take out half of those mussels and take out the flesh from the shells. Dispose the shells and put the flesh back into the pasta sauce. At this stage, add the scallops. 4. Add the other half of the tomatoes and let the sauce simmer for 5 to 8 minutes. At this stage, it’s important to notice how the broth from the mussels is slowly taking the color of the tomato. You can add the salt, basil, and chili at this stage. At the same time, you can add the rest of the olive oil as the broth starts to take in the color of the tomato. Another tip I can say is to make your sauce a little saltier than usual because you are mixing the pasta directly to this sauce. 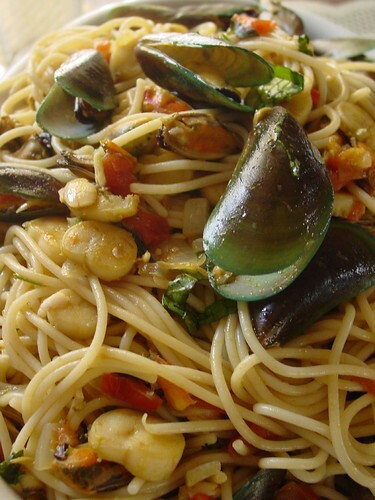 If you want to prepare this pasta on another day but need to cook the mussels already, you can steam the mussels beforehand and just save the broth and the amount of mussels you need for this dish. This is my recent pasta “sauce” favorite. Sans the seafood. Just olive oil, garlic, onions, tomatoes and basil! And mushroom if I have some in the pantry. You said it. This basic tomato sauce is very very versatile. Now if only tomatoes are in season, then we can have a field day with the pasta. It’s really yummy, isn’t it? Thanks for visiting! will try this one of this days.. where is bulungan?